Amelia's House was inspired in great Portuguese women, our rooms are named after lovely ladies Eva, Odete Isabel, Alda, Aurora, Emilia and Alice, each with its own characteristics, you’ll learn more about them at our place. 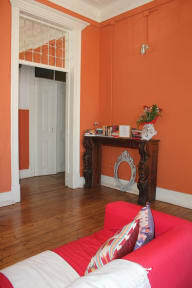 We like to welcome our guests, help them settle down and get comfortable after tiring journeys. We are offering maps and cool tips for transport, food, night life and activities. The apartment is so central that you can almost walk to every major attraction. If you prefer to use subway (metro), Cais do Sodré station is about 7 min walking distance where you can take the green line. Many bus lines very close and the old trams 28, 25 and 15 to our step. Metro station 5' walking distance Cais do Sodré, green line . We have two bathrooms (one female and one male). The apartment is located on a second floor (no elevator) of an ancient building, with its Pombaline architecture , with high ceilings very bright light, and all natural wooden floors. 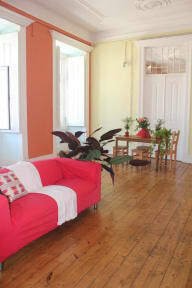 Our guests can use the kitchen, the living room with a big table and sofa, tv, books and other. The stay in our room includes: WIFI, Towels & sheets, Heater, hangers. Full equipped kitchen: Coffee machine (paid), Toaster, water boiler, microwave, oven, fridge, freezer. cable tv (in the common living room). Guests will have a set of keys. Overall okay hostel, nothing special. Located outside some bars in the student area, so very noisy in the room until 4am.